It's not hard to imagine why shimmering tinsel conjures thoughts of beautiful spider webs. Yes Virginia, there is a spider ornament on my Christmas tree. Each year as we put the finishing touches on our holiday tree, a serious debate arises regarding the quantity of tinsel necessary to perfectly complete the task. During this year’s festive deliberation, I pondered the murky origins of tinsel. To some the silvery strands of unknown composition evoke images of glistening icicles or shimmering crystals of frost on the evergreen branches. But how did tinsel become part of a holiday tradition in so many households? Spider egg sacs like these of the Basilica spider on holly sometimes inadvertently enter homes. To aficionados of arachnids, the tradition of festive tinsel has several different origins. One Christian story tells of Mary’s harrowing escape from Roman soldiers as she and Jesus hid in the hills near Bethlehem. With Herod’s legion in hot pursuit, Mary entered a cave seeking refuge. Spiders quickly sealed the entrance with silk and when soldiers arrived and saw the undisturbed webs, they disregarded the cave as a hideaway and continued their search elsewhere. Much maligned spiders saved the day! Since that time, tinsel has been strung on Christmas trees to represent a glistening spider web and to commemorate the spider’s miraculous deed. Other tinsel legends from Germany and the Ukraine tell of spiders escaping the lethal brooms of housekeepers by hiding in dark corners of the home, as preparations were made for holiday celebrations. After exiting their redoubts on Christmas Eve, spiders excitedly explored the evergreen trees that had been brought inside, and then left behind glorious cloaks of gossamer webs. When Father Christmas arrived that night and saw the gray spider webs, he miraculously changed them into sparkling silver strands, much to the delight of families who viewed the trees on Christmas morning. Since that time, tinsel has been strung as a symbol of the remarkable event. In the warmth of a home, spiderlings may soon hatch from this egg sac and decorate my tree with silk. Many spiders survive winter’s chill as eggs protected in silken sacs. 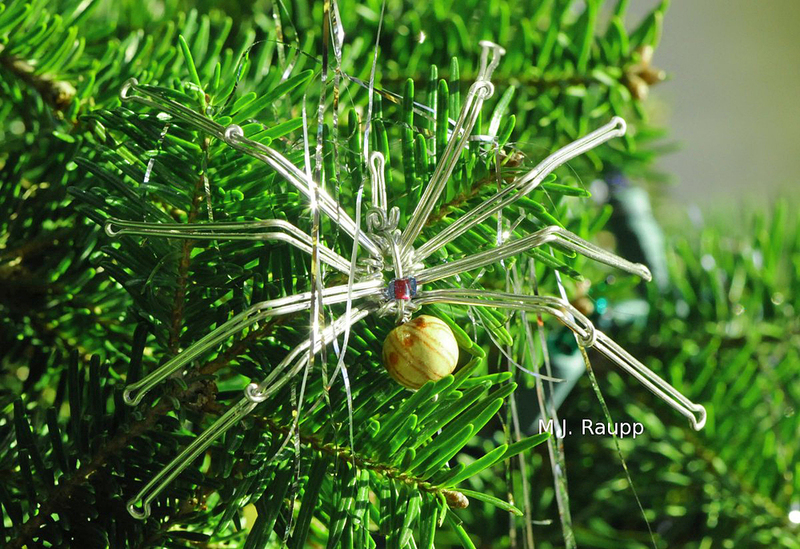 If the spider’s last haunt was a spruce or fir, then egg sacs may enter homes as stowaways on Christmas trees. In the warmth of holiday homes, the eggs hatch and humans may be recipients of dozens of unexpected visitors in, on, and under the Christmas tree. If you discover a spider egg sac on your Christmas tree or fresh evergreen boughs, simply pluck off a small piece of infested branch and place it and the egg sac outside on a shrub. This will allow the spiders to hatch just in time to deliver a deferred holiday gift of pest control in your garden. After hitching a ride on the Christmas tree, this small jumping spider patrols my house plants for prey.